Japan's $300 million Akatsuki spacecraft will fire its main engine Monday and drop into orbit around Venus for up-close investigations of the sweltering planet's noxious atmosphere. 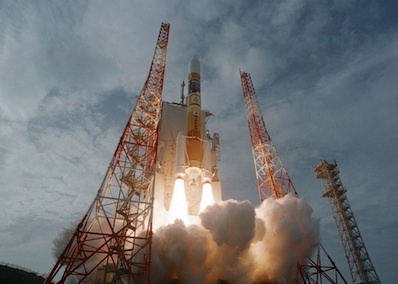 The 1,000-pound probe has been speeding toward Venus since launching May 20 from the Tanegashima Space Center. The nearly seven-month journey ends late Monday with an insertion maneuver into orbit around Venus. Akatsuki will be programmed to fire its primary maneuvering engine at 2349 GMT (6:49 p.m. EST) Monday for about 12 minutes, providing impulse to slow the probe enough for Venusian gravity to capture the spacecraft in orbit. Officials will have to wait 12 hours to determine the craft's orbit around Venus, according to information from the Japan Aerospace Exploration Agency. Akatsuki will conduct several attitude control thruster burns late Monday and early Tuesday, including a maneuver pointing its communications antenna toward Earth to radio its status back to ground controllers. News on the craft's orbit around Venus is expected around 1200 GMT (7 a.m. EST) Tuesday. The orbiter launched with Japan's Ikaros solar sail, which successfully unfurled an ultra-thin sail membrane last summer and demonstrated its viability as an alternative propulsion source. Ikaros is also on a trajectory toward Venus, but it will sail past the planet later this month and continue circling the sun. After Monday night's engine burn, Akatsuki's orbit will be fine-tuned over the next few weeks to reach an operational perch spanning from just above the Venus cloud tops to an altitude of nearly 50,000 miles. Akatsuki's five cameras will collect unparalleled data on the planet's atmosphere and runaway greenhouse effect for a two-year mission. Akatsuki also carries sensors to look for active volcanoes and search for lightning storms. The atmosphere of Venus is made up of thick carbon dioxide, clouds of sulfuric acid and super-rotating jet stream winds of up to 225 mph. The blanket of carbon dioxide drives surface temperatures to nearly 900 degrees Fahrenheit, hot enough to melt lead. The atmospheric pressure at the surface is about 90 times greater than at sea level on Earth. "Although Venus is believed to have formed under similar conditions to Earth, it is a completely different world from our planet, with extremely high temperatures due to the greenhouse effect of carbon dioxide and a super-rotating atmosphere blanketed by thick clouds of sulfuric acid," said Takeshi Imamura, Akatsuki's project scientist. Each of the probe's cameras is designed to study a slice of the Venusian atmosphere, ranging from surface imagery to observations of the planet's sulfur cloud tops at an altitude of 60 miles. Two short-wavelength infrared imagers will observe low-altitude cloud patterns, chart the distribution of water vapor and carbon monoxide, and map the surface of Venus with a goal of finding active volcanoes. Thick clouds prevent visible cameras from seeing the surface. Data from Europe's Venus Express orbiter earlier this year showed evidence of fresh lava flows around three mountains, giving scientists new hope of catching a volcano in the act. 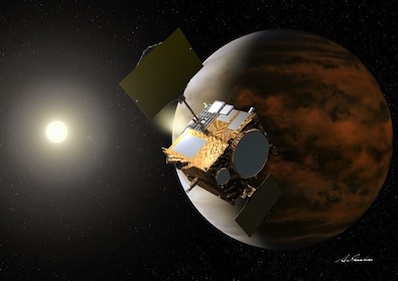 Venus Express continues studying Venus from an orbit similar to Akatsuki's planned trajectory. The probes will begin tandem observations in January. A long-wavelength infrared camera and an ultraviolet instrument will look at the super-rotating cloud structures in the upper atmosphere. The ultraviolet camera will also track sulfur dioxide, a precursor to cloud formation at Venus. Venus rotates on its axis once ever 243 days, remarkably slower than any other planet in the solar system. "On most planets like Earth and Mars, the atmosphere usually rotates very slowly as compared to the planetary rotation," said Masato Nakamura, Akatsuki's project manager. "On Venus, however, the atmosphere rotates at a very fast rate approximately 60 times that of the planet's rotation. In fluid mechanics, this very unusual behavior is called super rotation." Another camera will snap frames 30,000 times per second with a wide field-of-view to hunt for lightning at Venus. Results from Akatsuki will give scientists more tools to better understand how Earth and Venus differ. Scientists say Venus formed much like Earth and probably enjoyed calmer times in its ancient past. But something went wrong long ago, leading a potentially once-temperate Venus on an evolutionary course much different than Earth. Before researchers can pinpoint what caused Venus to become hellishly inhospitable, they must dispatch robotic missions to unravel the planet's conditions and how they link together. "Using [Akatsuki] to investigate the atmosphere of Venus and comparing it with that of Earth, we hope to learn more about the factors determining planetary environments," Imamura said. "From this viewpoint, we will be able to understand more about the reason why Earth is as it is now, and how it might change in the future."